India appears in the Barrow Lousada story in several ways, perhaps mainly because of the large number of Barrow military men who were there during the days of the British Raj. In the first place, so far as England was concerned, the dowry of Catherine of Braganza when she married Charles 3 contained the port of Bombay, which became an English foothold in India. The Portuguese were very active especially through Goa following early exploration successes. 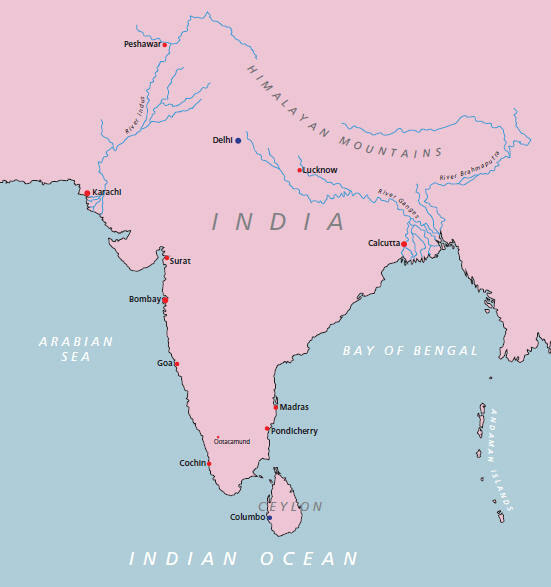 One of the areas of Indian trade that the Sephardic Jews profited by was the trade of Mediterranean coral for Indian rough diamonds from the Golconda mines in central southern India. Initially the trade connected Pisa and Goa, but with the advent of favourable conditions for new Jewish merchants in Livorno the trade shifted there. Growing British maritime strength led to Madras becoming the Indian outlet for its rough diamonds, and then with the advent of South American rough diamonds London became the centre of the rough diamond trade whilst Antwerp was replaced by Amsterdam in diamond finishing. As a consequence, Sephardic merchants moved from Livorno to London, Lisbon and Amsterdam during the early to mid 1700s for reasons connected to India. Simon Barrow of Bath in 1808 married the daughter of the wealthy diamond merchant Baron Lyon de Symons, just over a century after Moses Baruh Lousada at the end of his life was still receiving diamond shipments. Major-General Lousada Barrow 1816-77 #225 is commemorated in Lucknow for his enlightened word as a regional administrator. His son-in-law Major-General Boyce Albert Combe 1841-1920 #328 was stationed at Karachi. Tony Harding's great-great-grandmother Margaret Louisa Kemp #686 married Charles Louis Combe #999 (a first cousin of Major-General Boyce Albert Combe) and lived in Madras. General Sir George de Symons Barrow 1864-1959 #302 served in many areas of British interest and for a period was stationed in Peshawar at a time when this area was of strategic geopolitical importance. William Francis Barrow #1115, brother of George, was born in India. The great-grandfather of Tony Harding Frank Hunter Barrow #331 had a career in the Indian Civil Service at the same time as his cousin Lt-Col Frank Barrow #1097, and one wonders whether he met his mother Margaret Louisa there!